The tuna fishing industry was based on a long net trap, called tonnara, read this example page from the book (available as ebook and paperback). 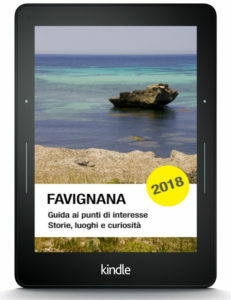 This chapter belongs to the book “Favignana, a guide to places of interest” available on Amazon. The mattanza has a thousands of years old history and a huge bibliography, and Favignana is undoubtedly the tonnara of Arabic origin most renowned in Italy. To reduce the mechanism introduced by the Arabs, which spread throughout the Mediterranean sea, to the simplest terms, the tuna fishing system known as tonnara is a fixed trap using a maze of nets laid in the sea for some kilometres, with the purpose of intercepting the schools of tuna fish. In particular, the one in Favignana captured the tuna fish schools that entered the Mediterranean sea from the Atlantic Ocean every year in spring to mate and then return to the Atlantic Ocean. Practically, they captured tuna fish when they thought they were going to make love. What a bad deal, poor fish! The nets were fixed to the sea bed with anchors (which can still be seen in the village near the Playa) in the shape of a sort of funnel, which directed the fish in a series of chambers, made of net, from which they were no longer able to escape. The maze of net lay in the sea for some months and was periodically checked to see how many tuna had entered it, and when they were enough, the fishing procedure began. The fishing began by manoeuvring the nets in order to make the tuna move from one chamber to the other until they reached the last one, known as the death chamber. The bottom of this section could be lifted. The tonnaroti (fishers of tuna) rowed their boats alongside the death chamber and gradually drew the net into their boats until they reached the fish, which they hauled then onto the boat by hand with the aid of harpoons. Described like that, it is a little cold story, but actually in the tales of those who took part in it, or those who only saw it, the event sounds much more savoury and suggestive, there was the rite and the mystery, there was the struggle between man and nature, and there was the horror of death. In the days of the mattanza, at dawn, the rais had to decide, based on his experience and his knowledge of the sea, the winds and the currents, whether the day was good for fishing tuna, in particular whether the sea would be calm throughout, because the mattanza lasted several hours and to put to sea with a risk of it becoming rough was dangerous. The tonnaroti prayed before leaving, sang ancient songs while drawing up the nets, followed the instructions of the rais, and then struck the tuna fish at his command. The death of tuna fish turned the sea red, and in the turmoil of their struggle for survival the fish happened to would one another. They banged their tail fin against the boat sides, and could they only howl it would have sounded like hell. Sometimes, two or three fishers were necessary to haul a tuna onto the boat, and the fishers’ movements were to be well trained and careful because, while being hauled, the fish struggled to get free and its tail could struck the fishers and cause large wounds. At the end of the struggle, the biggest fish was given as a prize to the tonnaroti. Over the years, the number of tunas decreased due to intensive fishing within and without the Mediterranean: by now, the tunas reaching Favignana waters are few and small and the cost of keeping the industry going is no longer sustainable. Little by little the industrial activity has vanished and what remains is mainly the folkloric and touristic aspect of it, artificially supported also with government aid and the money of the last picturesque tonnaroti, Gioacchino Cataldo and Clemente Ventrone, who tried to keep the tonnara going by investing their savings. You can still meet them at Favignana, powerful seamen, looking more like pirates than fishers. Just to give you a few numbers, in 1845, they fished 14,020 tunas, the record, in the 1960s the average was about 3,500 fish per season. In 2007, they were less than 100. since 2008, they have stopped setting down the nets. From time to time, there is talk of re-opening the mattanza, but it is difficult to evaluate the number of fish that might be captured and, hence, the feasibility and the economic significance of that proposal. It is also true that it is so difficult to give up a piece of history of this island that now they are talking of how to set up a mattanza for tourists, and a sustainable one at that, by capturing only the biggest tuna fish, taking the tourists out to fish and giving the fished tunas to restaurants. To support this view, we must say that the international rules issued by ICCAT, which limited and fixed the yearly quotas to be fished by country and fishing system, have given god results. The tunas entering the Mediterranean have increased in numbers, and it is thought that there is a possibility that new small fishing quotas may be granted to Favignana tonnara. Let’s wait and see.